These were the words of Presidential Candidate Hillary Clinton during a campaign speech on July 8, 2016. And she is quite right. According to a World Prison Brief study released this year, there are over 11 million people confined in prisons throughout the world, with 2.24 million of them locked behind bars in the United States alone. The U.S. population count as of 2014 was 319 million which means that 4.4 percent of the total world population estimated at just over 7 billion of the world’s jailed people are locked up in the United States. That amounts to 698 people per 100,000. What is really shocking is that the World Prison Population List, based upon statistics for the International Center for Prison Studies, shows that the U.S. currently has more people in prison per capita than almost every nation in the world. The only countries in the world that exceed us are North Korea with somewhere between 600 and 800 per 100,000 behind bars and the Seychelles archipelago off the coast of East Africa that locks up 799 per 100,000. In the U.S. not only do we have 2.4 million people living in prisons and jails, but another 7 million are currently under correctional control. That involves parole and probation. 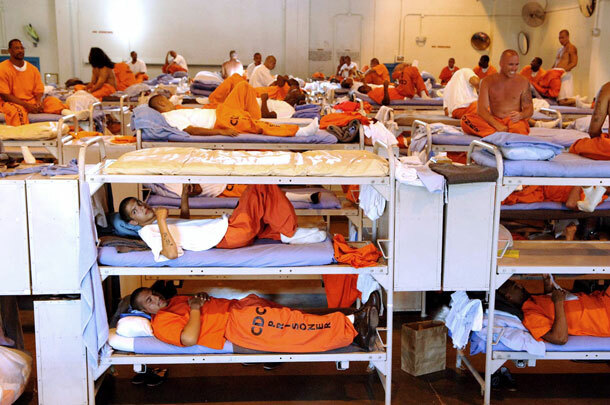 The nation spends an estimated $80 billion a year just to pay for all of these jails, prisons and the cost of housing and feeding all of these people. We doubt if this covers the money paid for the police, the courts, lawyers and the financial assistance needed for families of jailed prisoners. The housing of all of these prisoners has been shifting to privately owned and operated prisons, which are not only being paid to house the prisoners, but are utilizing these people as low-cost labor. This appears to be a legalized form of slavery. And while the number of people being held in prisons is on the increase, statistics show that the nation’s crime rate has remained somewhat unchanged. Looking back a few years we see that there has been a shocking increase in incarceration rates since about 1971 when President Richard M. Nixon launched the nation’s infamous “War on Drugs.” At that time the prison population was estimated at about 200,000. Hitched on with this insidious drug war has been a policy demanding stricter sentencing laws and mandatory prison terms for drug offenders. Thus even as states are now moving toward legalizing marijuana for medical and even recreational use, we have many people serving lengthy prison terms for possessing, growing and selling marijuana. The social damage of what has been going on has been terrible. Most severely hit have been families of the minorities and the poor. One study notes that black men under age 35 with no high school diploma are more likely to be in jail than working in the labor market. Children in minority families are growing up in a struggling household with a parent in jail. Mrs. Clinton has recognized this terrible problem in her public speeches, and the Democratic Party has obviously included a plan for reducing mass incarceration in its platform if Democrats can maintain control of the presidency and Congress for the next four years. --Ending mandatory minimum sentences for nonviolent offenses. --Seek alternative punishments for low-level, nonviolent offenders. --Calling for all police officers to carry body cameras and to end racial profiling. --Seek ways to help inmates find jobs once they are released from prison. --Provide better economic opportunities for the poor and middle class. --Senator Bernie Sanders has just introduced a bill that would ban privately owned and operated prisons. These are all haughty goals that will be tough to reach unless a party majority follows Hillary into office this term. With another Congressional Republican logjam piled in her way, even if she gets into office, few of these goals will be reached. We suggest that the most direct way to fix this mess is to bring the War on Drugs to its conclusion and stop contracting with private business that own and operate a large number of the nation’s prisons. All of the people serving prison time on marijuana drug charges should be released immediately.